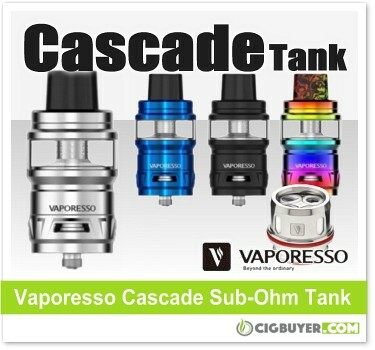 An extremely popular option in the sub-ohm tank space, the 25mm Vaporesso Cascade Tank holds a ton of e-juice (up to 7ml) and is compatible with the entire line of GT and NRG Cores. It’s innovative Isolation Structure was developed to prevent dry hits and effectively separates the coil from the juice chamber. The Cascade Tank has a sliding top-fill design with triple bottom adjustable airflow and comes with two threadless, plug-and-pull GTM coil heads (0.2 ohm GTM 2 Dual Core (40 – 80W) and 0.15 ohm GTM 8 Octuple Core (80 – 200W)). It also includes a GT Core Adapter to use with Vaporesso’s NRG coils.